Before the 2011 season, Hollister San Benito HS (CA) had not won their conference championship, the TCAL, in seven (7) years. In 2011, after running a camp with Lou Cella as Camp Director, Hollister San Benito HS (CA) won the TCAL Conference Championship, went undefeated in conference play, and made it to the CIF Division 1 Quarterfinals. 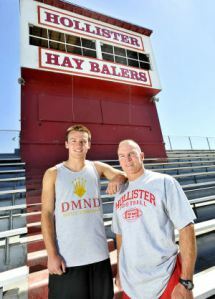 “After coaching the Hollister Haybalers of San Benito High School for the past 17 years with good success, I found myself and our coaching staff in a bit of an offensive rut. I began to research the Triple Option offense. I had heard about the camp.